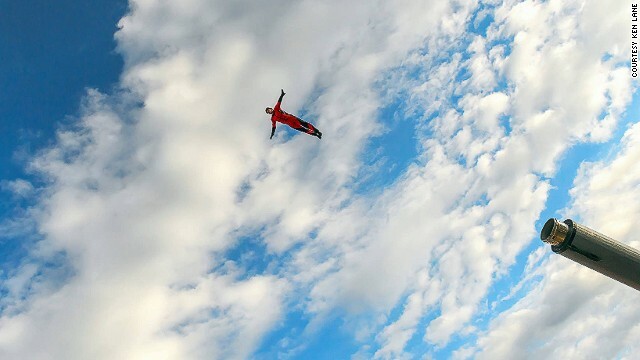 Meet Robin Valencia, one of a family of human cannonballs. The mother-of-two from Oregon first shot out of a cannon as a teenager, in a barrel her uncle built in his basement. 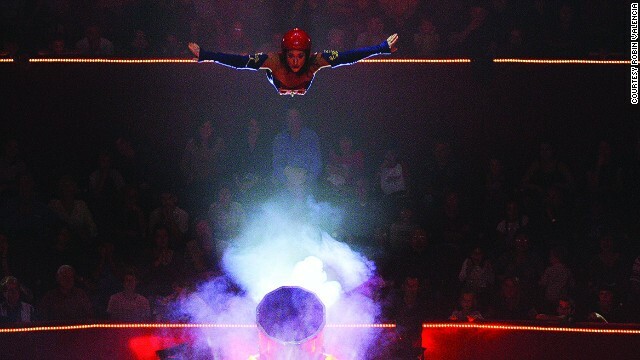 Two decades later she goes by the stage name "Shooting Star," working alongside her human cannonball husband, Chachi. 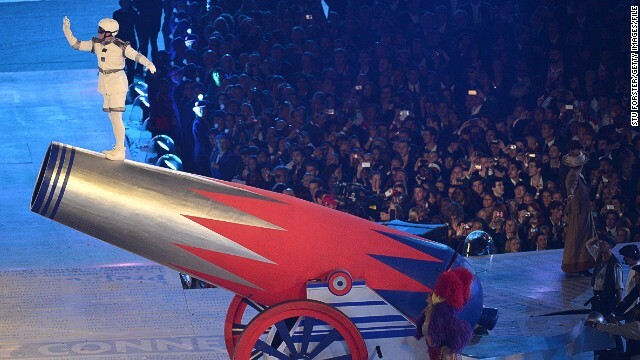 Chachi flew 55 meters at the 2012 London Olympics closing ceremony, in front of a crowd of 80,000 people, pictured here. The couple met when Chachi (pictured mid flight) was working as a flying trapeze artist in a circus in Texas. They decided they wanted a career together -- cannonballing. 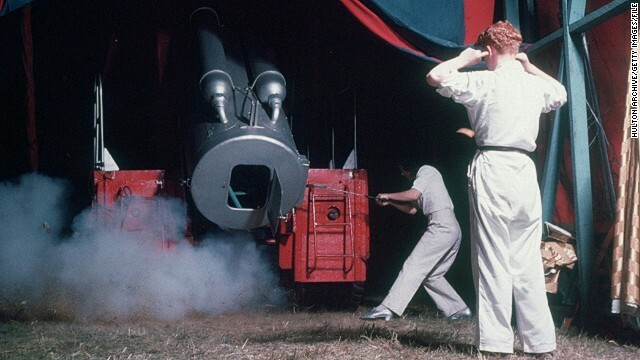 Two stage hands fire a human cannonball at a Chipperfield's Circus in the 1950s. The inner-workings of the barrel is a guarded secret by human cannonballs. 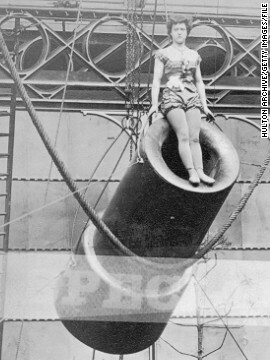 Many believe 14-year-old acrobat, Rosa Maria Richter, billed as "Zazel," was the world's first female human cannonball, pictured here at the start of her act at the Royal Aquarium in London in 1877. Editor's note: Art of Movement is CNN's monthly show exploring the latest innovations in art, culture, science and technology. (CNN) -- You've built a cannon. Now you just need a willing participant to crawl inside. Robin Valencia's uncle always seemed like a bit of "a mad scientist." And growing up next door to him in Salem, Oregon, she didn't think much of the fact he was building a giant cannon in his basement. That was just David Smith, a math teacher and trained gymnast who was so fascinated by circus cannons, he went ahead and made one. Then he fired himself, his two children, and his niece out of it. It was the beginnings of one of the world's most remarkable human cannonball families. Smith Snr is celebrated for such spectacular stunts as being fired over the Mexican border. While son David Smith Jr holds the world record for the highest shot in the air, a whopping 26 meters. But the cannon is more than simply an unusual career choice for niece Valencia, who today goes by the stage name "Shooting Star." It's how she met her husband Chachi Valencia, better known as "The Rocketman" who blasted into the sky at the London 2012 Olympic closing ceremony. For over two decades the cannonball couple, now in their 40s, have traveled the globe shooting each other into the blue yonder. It's a nomadic lifestyle, and they currently live in Paris with their two daughters, working with the Finnish State Circus. Where they could be called to perform next, is anyone's guess. But Chachi is used to the giddy heights -- he is the fifth generation of a flying trapeze family from Chile. That's how he met Robin. "He was a trapeze artist in the same circus show as my cousin," she explained. "We fell in love and wanted to do something on our own." That special something was cannonballing, and the loved-up teenagers enlisted the help of Smith Snr to build them a five-meter-long aluminum and stainless steel cannon, which Robin still uses to this day. Seeing Robin flying through the air in her luminous catsuit, red helmet gleaming like a candy Jaffa, she appears like a retro superhero zooming 12 meters above the gasping crowd below. Yet even after all these years she still finds the experience nerve wracking. Why does she do it? "The actual flight, free flying through the air with nothing attached to you, is amazing," she says. There's no denying it's an awesome spectacle. But not one without serious injuries and fatalities, including a man who died in the UK in 2011 when his safety net collapsed. Before Robin slides down the barrel, there are landing calculations to be done, and sand-filled dummies to be test launched. "People don't realize how much time it takes preparing, taking into consideration things like the weather, the humidity, temperature, wind, and doing your math formulas correctly," said Robin, who must land flat on her back in the middle of a giant air-filled target. 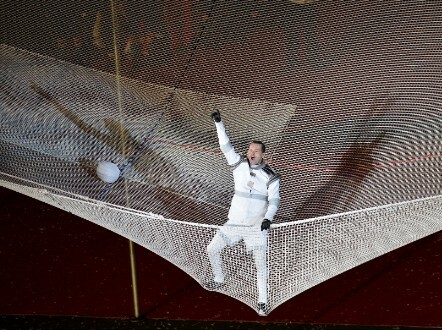 Back to Earth: Chachi Valencia celebrates after landing safe and sound at the London Olympics. "I use an airbag, so I have an electric fan that fills it with air. That means the electricity has to be very safe and secure and no one can unplug it -- which has happened to me before." Luckily for Robin, someone plugged in the fan again just in time. Showmanship is a huge part of the performance, and seeing Robin work the crowd before the big bang, is a bit like witnessing the dramatic entrance of a wrestler before a fight. But after she slides down the darkened barrel, just what goes on inside? "You have to make sure that you have every muscle tight, and your neck and spine aligned," she explained. "You have to be completely up against the mechanism that fires you through the air -- because if you're away from it, or not ready, or your body is loose, then it would be like being hit by a semi truck." The shorter the barrel, the more violent the impact, meaning Robin tends to take more of a blow than Chachi in his 10-meter-long cannon. "You could never in your wildest dreams imagine the kind of impact it takes to fire you out of a cannon," she says. "It's instant. Your take-off is in the blink of an eye. You go from nothing to 80 kilometers per hour." When it comes to explaining how the cannon works though, Robin is less forthcoming. "It's a trade secret," she said. "It's not just our family, but all human cannonballs are pretty secretive." That said, the only gunpowder you're likely to find in modern cannons is in creating the bang and puff of smoke. Instead, compressed air or a bungee cord are used to propel a small platform -- which launches the performer sky high. But the gasp-inducing performance seems to have lost none of its magic, with audience members telling Robin after the show: "It was the best six seconds of my life." Does that mean she and Chachi will be encouraging their children to also enter the trade? "No, I don't think so," she says with a nervous laugh. "I'd like them to remember their cannonball parents -- but that doesn't mean I want them to be ones themselves." Read: Is this the fastest flying woman on Earth?